even as he grew old,mr.umpire never got bored of tripping up fast bowlers. Last edited by open365; 19-11-2005 at 03:08 PM. It has always perplexed Superman as to why, whenever he tries to get a game of cricket in, the world suddenly needs saving. As Cristiano Ronaldo hurled himself to the ground & turned to appeal to the umpire it became apparent that not all of his skills would be transferable to cricket. At the precise moment that Dutch speedster Hertz van Rental launched into his delivery stride, the inevitable repercussions of his recent visit to the 'Spliff-U-Like' Cafe, Amsterdam, kicked in. Fearing the worst, he threw himself to the ground, only to miss. Steve Harmison's plan to make him feel more at home when on tour by importing beans especially from the Middlesborough Co-Op backfired slightly. Last edited by Burpey; 22-11-2005 at 04:33 AM. This bowler obviously misses Andre Nel. 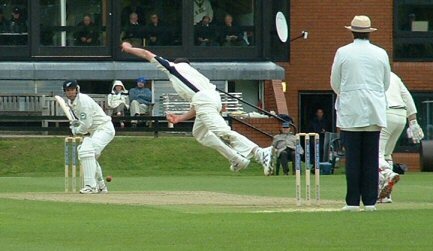 Bowler: What do you mean, falling away in my delivery stride? "You tried and you failed miserably. Lesson here is never try"
Weird Drinking out of the wrong instrument? Balaji bowling action is flawed. Murali cleared!!! .... or not...?